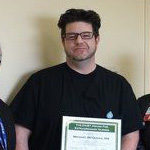 Strongsville native Michael McQueen, a registered nurse at MetroHealth Medical Center, has won an award for outstanding nursing from the California-based DAISY Foundation. McQueen, who today lives in Wickliffe, was honored for his care of a blind patient with esophageal cancer. McQueen helped the patient medically through the final months of his life and connected with him as a fellow Cleveland Indians fan. Congratulations Michael and good keep up the good work. Strongsville Historic Village will welcome third-, fourth- and fifth-graders to commemorate the fourth year of the Civil War Encampment education program from 9 a.m. to noon July 28 to Aug. 1. The children will take part in activities common to the Army of the Ohio in 1864. The $80 fee covers the cost of a haversack and kepi. Daily snacks are provided. Arts in Strongsville will have its fourth annual Art & Chalk Walk from 9 a.m. to 2 p.m. May 17 in the city commons at Royalton and Pearl roads. Children 5-18 are invited to create chalk art on the walk. Cash prizes will be awarded in various categories. Some artists will also paint on canvas during the event.